Right in front of Fórum Madeira shopping centre rises 4-star Duas Torres Hotel. All studios have a fully equipped kitchenette, a private bathroom with a shower, a seating area and a balcony, and most of them have an ocean view. 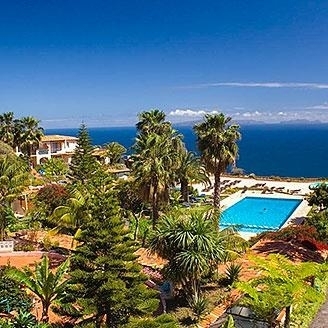 Some of the hotel facilities include an outdoor swimming pool, hot tub, tennis court, gardens, sun terrace, bars and an à la carte restaurant that serves both Portuguese and international cuisine. For those who prefer to prepare their own meals at their studio, there is a supermarket less than 5 minutes away. 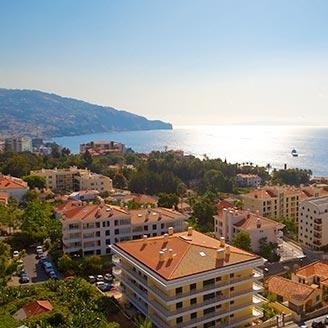 Just 3 km away from the centre of Funchal, four-star Madeira Panorâmico Hotel offers a good compromise between relaxation and physical activity. After playing tennis or squash on the courts or spending some time in the gym, guests may chill out by the indoor and outdoor pools or at the spa. The comfortable rooms have a balcony, where you may read a book or have a drink while enjoying the sunset. The hotel provides entertainment and several recreational activities for their guests. 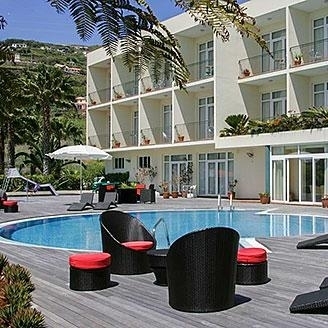 Madeira Bright Star is a 4-star hotel close to the Funchal harbour and CR7 museum. Rooms are decorated in soft colours with wood furniture and are equipped with flat-screen TV and air conditioning. At the hotel, there is a restaurant, a bar, as well as an outdoor swimming pool with sunbeds and a game room, where guests can spend some quality time. There is also evening entertainment, but if you want to leave the hotel, Madeira Casino is within walking distance. 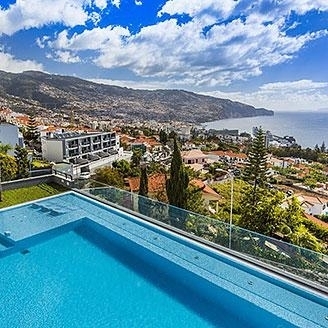 On the rooftop terrace overlooking Funchal and the Atlantic Ocean, the Terrace Mar Suite Hotel guests may enjoy the heated swimming pool and the hot tub. All studios and apartments are spacious, have a modern and comfortable décor and are equipped with a kitchenette, sitting area and air conditioning. 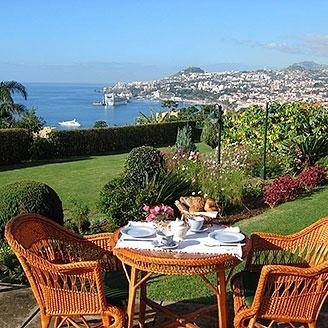 This four-star aparthotel is located very close to the city centre and the sea, next to the Promenade, where you can take long botanical walks by the sea front, all the way to Praia Formosa, the main beach area in Funchal. 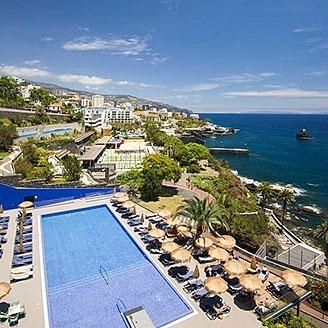 Four-star hotel The Lince Madeira Lido is, as the name indicates, located in Lido, the main tourist area in Funchal. Since the hotel is very close to the city centre, you may walk to several interesting places to visit, as the Museum of Natural History. And after a long day having fun, the outdoor pool on the terrace, with amazing views of Funchal and the ocean, will be the perfect place to relax and enjoy the beautiful sunset over the city. Quinta de São Gonçalo was first built in 1853 and then restored in 1999, with cosy rooms decorated in an antique style. 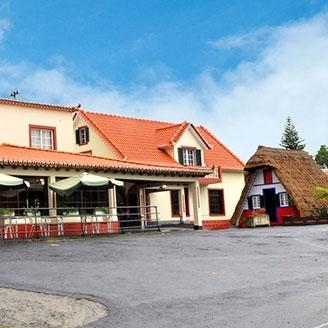 This 4-star bed and breakfast accommodation is only a 10-minute drive from Funchal, thus being a good option for those who prefer to stay away from the city centre but still be close enough to visit it easily. Surrounded by 3500 m2 of tropical gardens, their guests may easily breathe in the peaceful nature. 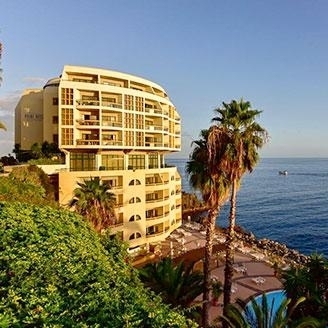 Four-star Ocean Gardens, located on a cliff top, just a few minutes away from Funchal city, has both sea view and bay view rooms, comfortably furnished and decorated. Near the outdoor pool, at the top floor and surrounded by gardens, guests may enjoy the sauna, as well as a relaxing area for massages and treatments. 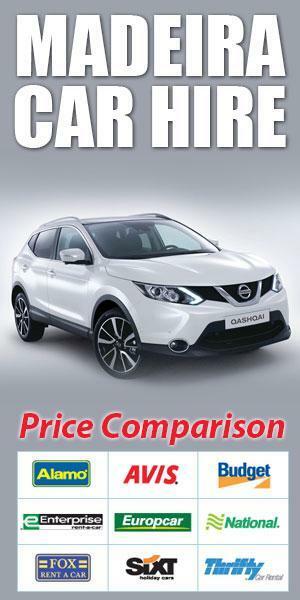 The hotel also has free private parking, as well as a steakhouse, where you may taste delicious regional specialities. A historic feature of the hotel is a small cave that had an artillery piece used to defend Funchal bay against pirates. 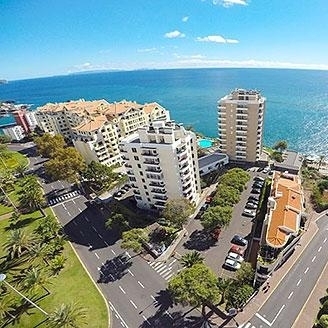 Right at the heart of Estrada Monumental, just 2 km away from the city centre, is 4-star Hotel Alto Lido, surrounded by restaurants, bars, cafés, shops and all kinds of useful services. All rooms and studios have a balcony, are decorated in a modern style, with bright colours, and include amenities like flat-screen TV, satellite channels, safe and air conditioning. Studios also have an equipped kitchenette. The hotel features an outdoor, as well as an indoor swimming pool, sauna, fitness centre and a squash court. 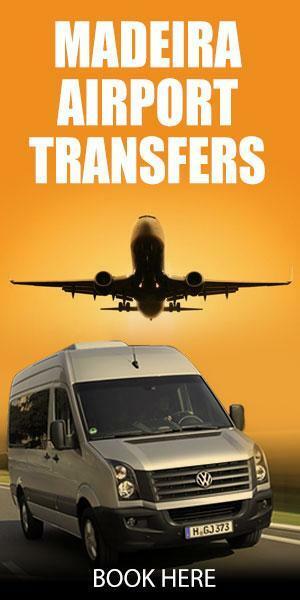 Guests may also benefit from the hotel’s shuttle service to the city centre. 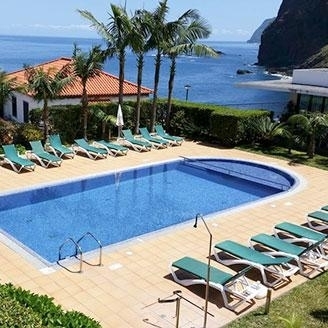 With an outdoor pool overlooking the Atlantic Ocean, four-star Hotel Baía Azul is well located near Funchal. All rooms have a balcony with either a sea view or a mountain view, and are equipped with cable TV and air conditioning. There is a large game room where guests have different recreational activities at their disposal, such as several pool tables, board games and a ping-pong table. Other amenities and services include sauna, babysitting, free parking, as well as valet parking. Multilingual staff will help guests in everyway they can. 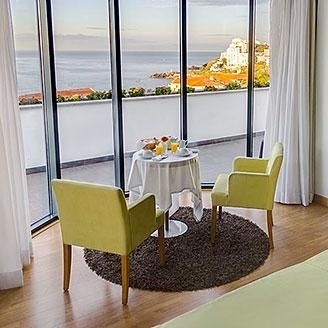 Only 3 km away from Funchal, near Madeira Casino and CR7 Museum, is 4-star Hotel Escola, featuring rooms with modern decoration and balconies with sea view. Breakfast is à la carte, and the restaurant serves both regional and international cuisine. Room service is also available for guests who prefer to stay in their rooms. There is an outdoor pool and a sauna at their disposal, as well as laundry service and a shuttle service that can be arranged by the hotel staff. 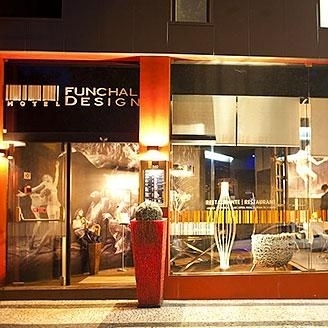 Right in the city centre, within walking distance from the Funchal Cathedral, four-star Funchal Design Hotel is a great choice for travellers who care about location and comfort. Featuring a trendy black and white atmosphere, with particular attention to detail, rooms are comfortably decorated, have wi-fi and a flat-screen TV, as well as a fully equipped kitchenette. The modern bathroom, with partly transparent glass walls, is spacious and includes bathrobes and slippers. 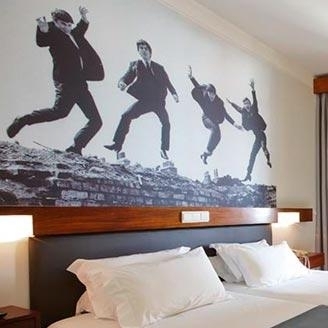 The same unique style and décor are also present in the common areas, with large black and white photos on the walls, including at the hotel restaurant, which serves both regional and international dishes. 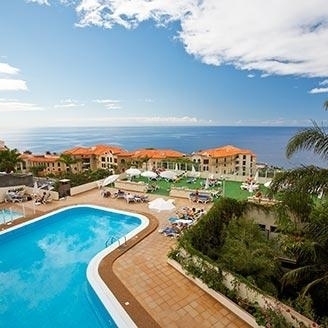 Galo Resort Hotel Galosol is a 4-star hotel in Caniço, on the southeast coast of Madeira. The hotel features both outdoor and indoor swimming pools, as well as a gym, where guests who enjoy physical exercise may participate in aerobics or yoga classes. There is also a diving centre that offers unique experiences. Those who prefer a quieter atmosphere may enjoy relaxation treatments, massages and beauty services. The air-conditioned rooms are elegantly decorated, have satellite TV and a balcony overlooking the garden or the ocean. In the case of Quinta Splendida Wellness & Botanical the name says it all – this four-star hotel offers its guests a splendid accommodation experience, thanks to its wellness centre, lush botanical gardens and stylish décor. The studios, double rooms, apartments and luxury suites have comfort and elegance as a common feature, and include all modern amenities a guest may desire. The orient inspired hotel spa, one of the largest in Madeira with 1,400 m2, offers the senses a completely transcendent experience, with a full wellness concept in mind and several unique particularities, such as heated stone loungers or an ice fountain. Four-star Hotel Royal Orchid has a great seafront location that allows their guests to have amazing panoramic views of the ocean. The hotel has studios, suites and even a penthouse, with a private hot tub. All rooms are comfortably decorated in a modern style and feature a fully equipped kitchenette, air conditioning and satellite TV. Guests may choose between rooms with a mountain view or a sea view, the latter having a balcony. 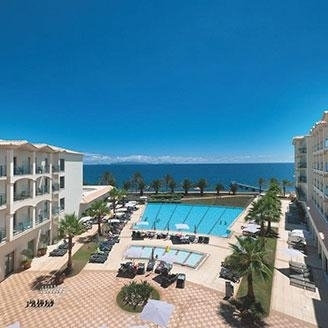 The outdoor swimming pool overlooks the Atlantic Ocean and is surrounded by sunbeds, while the heated indoor pool is located in a secluded ambiance. Guests may delight their palate at the hotel restaurant, where they can taste several Madeiran specialities. 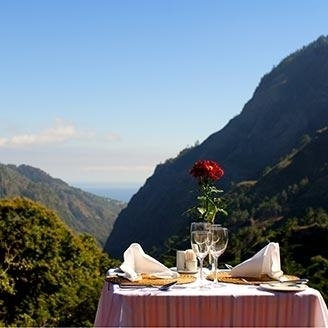 On the top of a cliff, 30 m above sea level, is Galo Resort Hotel Alpino Atlântico, an adults only 4-star accommodation in the Caniço de Baixo resort area, 12 km from Funchal city centre, with breathtaking views over the ocean. 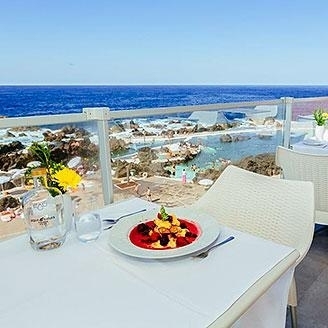 The hotel has comfortable rooms, restaurants and bars, as well as two outdoor swimming pools – the freshwater pool on the terrace of Galosol Hotel and the saltwater pool at Lido Galomar pool complex. 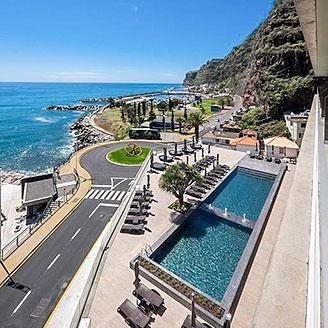 The sauna area and the indoor pool are part of Onda Revital Club, at Galosol Hotel, but the Hotel Alpino Atlântico offers its guests a sauna with a sea view in its garden. 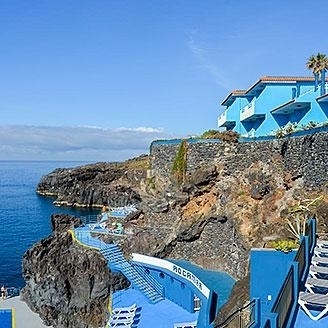 Four-star Hotel Roca Mar stands on a cliff-top, overlooking the Atlantic Ocean, thus offering amazing panoramic sea views. Rooms have a modern discrete decoration and are equipped with satellite TV, air conditioning and a balcony. Guests have access to the health club at the neighbour Hotel Royal Orchid, which includes a gym, a large room for group activities, a heated indoor pool, Jacuzzi, sauna and Turkish bath, thus having a wide choice for relaxing during their vacation. The restaurant serves delicious local and international dishes, and guests may have a drink and listen to good music at one of the two hotel bars. 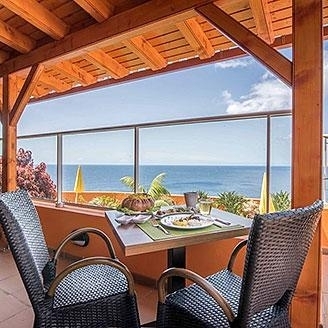 As a tribute to the local sugarcane industry in Calheta, four-star Savoy Saccharum Resort & Spa is perfectly integrated into the landscape that contemplates the mountain and the ocean. The industrial design, inspired by the old sugarcane mills, is the hotel’s trademark. All rooms, suites and apartments have a high standard of comfort and modernity, and their décor embodies concepts such as luxury and aesthetics. The hotel features 3 outdoor swimming pools, with a large solarium, a squash court, a gym and a fitness club. It also has a spa, for guests over 16, with a heated indoor pool, sauna, hot tub, Turkish bath and a sensorial shower. 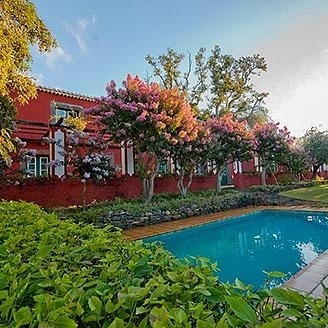 Four-star Quinta das Vinhas is a manor house from the 17th century, in Calheta, that has been restored, keeping its rustic character on the floor and on the walls with elements, such as flagstone, wooden floors or hand-painted tiles, called ‘azulejos’. The same antique charm is present in the room décor, with arch doors, solid wood furniture and flowery pattern quilts and curtains. Around the outdoor swimming pool there are several cottages, where guests may have their own holiday house and prepare their own meals. 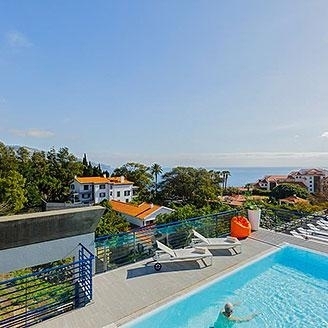 Located in Calheta, 4-star Quinta Alegre offers its guests a large garden with an outdoor pool and sunbeds, where guests can relax after a swim. For those who prefer to dive in the sea, Calheta’s sandy beach is only 2 km away. The comfortable rooms have private bathroom with hairdryer, satellite TV and a desk. The hotel has a restaurant, a cafeteria, a bar, TV and reading rooms, a wellness room and a small gym. There are also free bicycles available at the hotel for those who like to tour on two wheels. 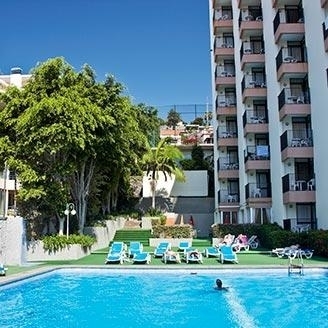 Four-star Hotel Jardim Atlântico includes several types of self-catering accommodation – studios, apartments and bungalows, where guests can prepare their own meals in the fully equipped kitchen. The studios are comfortably decorated and include the bedroom and seating areas in the same space. Apartments have one or two separate bedrooms, while bungalows are the most spacious option, with a larger balcony over the ocean. The hotel features an outdoor and an indoor swimming pool, tennis and badminton court, a nudist terrace, a gym, a game room and a mini-market. If you want to experience a true communion with nature, the barefoot path is an excellent option to try feet reflexology with natural elements from Madeira Island. 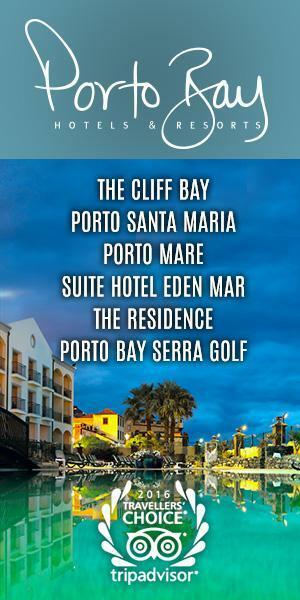 Very close to Santo da Serra Golf Course, Porto Bay Serra Golf is a charming 4-star hotel surrounded by gardens. The main house, a palatial building from 1920 that was restored in 1999, features unique Art Nouveau elements on its façade. The elegantly decorated and spacious rooms are equipped with cable TV and DVD player. The hotel’s restaurant serves local specialities with a sophisticated twist. Also, guests who enjoy an afternoon tea by the fireplace will love the homemade scones and jams. The hotel features a heated indoor swimming pool, sauna, gym, as well as a reading and game room. 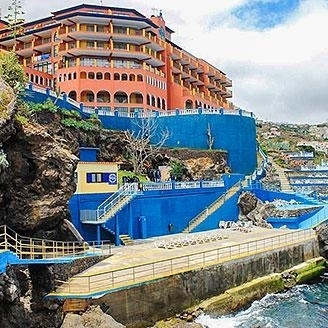 Located in Porto Moniz, known for its natural swimming pools, Aqua Natura Madeira is a comfortable and sophisticated four-star hotel between the sea and the mountains. The spacious, modern rooms and suites offer their guests amazing direct ocean views from the balcony. Wellness plays an important role at this hotel, so guests have a hot tub, sauna, solarium, massage room and gym at their disposal. There is a diving centre onsite that will be great for sport lovers. At the hotel restaurant, guests will have a taste of local products treated in a unique way by the chef. Perfectly positioned over the ocean, 4-star Hotel Quinta do Furão has kept its charm throughout the years. 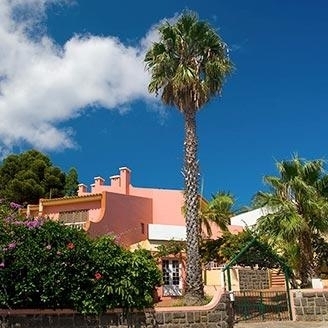 Initially used as a wine-producing property, it opened its doors in 1998 as a high quality accommodation in the northeastern part of the island. All rooms, suites and villas are elegantly decorated in an antique style with wooden furniture and soft colours. The heated indoor/outdoor pool (due to a sliding roof), the whirlpool and the sauna evoke relaxation. 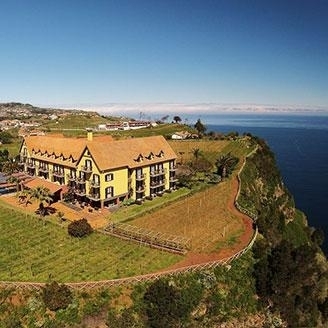 The hotel also features a wine cellar, where wine lovers may see the traditional wine press and taste several types of Madeira wine. There is also a pub and a game room, where guests can have a light meal or a hot drink, while playing billiards or darts. Hotel O Colmo is a four-star accommodation located in the centre of Santana, a village known for its traditional Madeiran houses. The hotel has several facilities available, namely indoor pool, sauna, Turkish bath and hot tub, ideal for an even more relaxing holiday. Rooms are comfortably and discreetly furnished, matching the rest of the hotel common areas, including the restaurant that serves traditional cuisine. 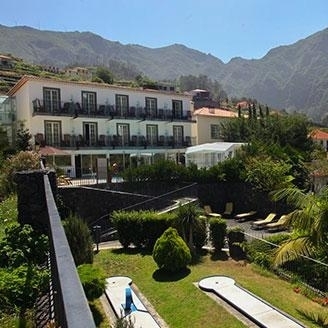 Very close to the natural lava rock pool complex of Porto Moniz and the Madeira Aquarium is Hotel Moniz Sol, a 4-star accommodation with an indoor pool, hot tub, sauna and Turkish bath. The spacious air-conditioned rooms have plenty of natural light and beautiful sea views from the balcony. The à la carte restaurant, Bútio, serves both local and international dishes, and every morning there is a vast buffet-type breakfast. 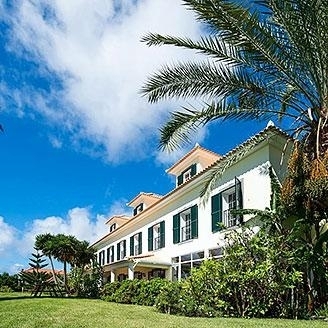 Estalagem do Vale is an 18th century manor house in São Vicente that was restored to become a four-star accommodation. Surrounded by the Laurisilva Forest, a UNESCO World Heritage Site, this building started as a small hotel 150 years ago, then a school and even a hospital for the local community. Nowadays it is a charming hotel, with comfortable rooms that combine the classic decorative features of the manor house rooms or the clean style of the standard rooms with modern conveniences, such as Internet access, cable TV or central heating. The hotel also has a heated outdoor/indoor swimming pool (with a sliding cover), sauna, hot tub and Turkish bath, where guests can relax. 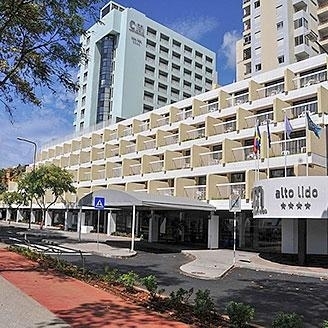 Vila Galé Santa Cruz is a contemporary 4-star hotel right by the sea and 5 minutes away from the airport. All rooms and suites have a modern stylish décor with en suite bathroom, private balcony, satellite TV, DVD and CD players. This hotel has several wellness features, such as a large infinity outdoor pool, a heated indoor pool, sauna, hot tub, Turkish bath and a gym. Guests may have a drink or a snack at the bars or taste both regional and international dishes at the hotel’s restaurants. 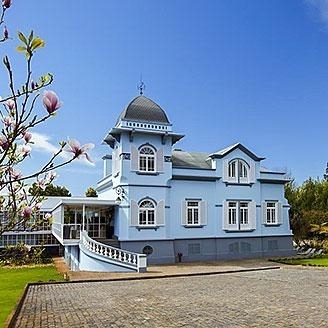 Located in Ponta Delgada, a village on the North coast of the island, Casa da Capelinha is a 4-star hotel between the mountains and the sea. The main building, a manor house, consists of four apartments and there are eight more T1 apartments, all of them with fully equipped kitchen, satellite TV and heating. The hotel has a 16th-century chapel, an outdoor swimming pool with sunbeds, as well as a restaurant, where guests may have a drink or a meal. 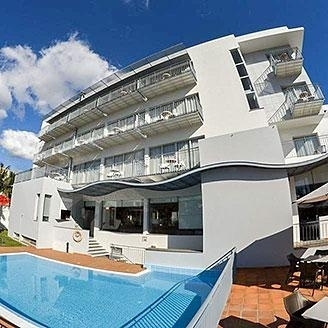 Just 2 km away from the centre of Funchal is Pestana Palms Ocean Aparthotel, a 4-star self-catering accommodation that comprises studios and apartments, all with a fully equipped kitchenette and great ocean views due to their ocean front location. The common areas are located in the manor house, while the rooms and the restaurant can be found in the modern building, next to the outdoor swimming pool. The hotel also has direct access to the beach. Guests have at their disposal the hotel’s fitness centre, including a hot tub and a massage room, as well as a diving school for anyone who wishes to have this type of sport experience. 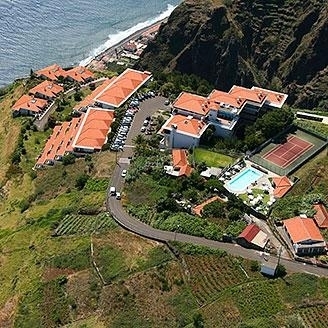 Four-star Hotel do Campo has a privileged location in Ribeira Brava, on the southwest coast of the island, between the sea and the mountains. The outdoor saltwater swimming pool surrounded by sunbeds offers delightful view over the ocean. Guests may work out at the gym, relax in the Jacuzzi and Turkish bath, read a book in the reading room or have fun in the game room. The comfortable rooms have extra-long beds, satellite TV, en suite bathrooms and beautiful natural light. 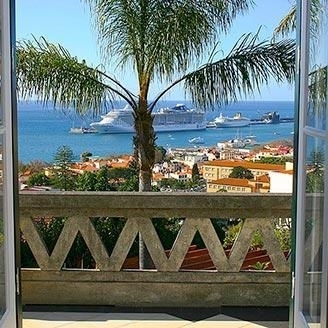 Choose the Hotel do Carmo for your holiday, an inviting 3-star hotel situated in the picturesque centre of Funchal. A modern restaurant, a bar, comfortable rooms and a calm rooftop pool make this a fabulous place for your retreat. Located near the city’s foremost attractions, this 3-star hotel is an idyllic destination for all travellers. 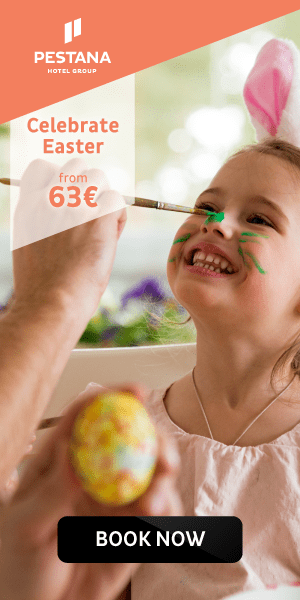 If you are looking for the ideal holiday destination, the Arts In hotel Conde Carvalhal is the answer you’ve been looking for. A natural environment composed of pretty green gardens, a view of the sea and relaxing outdoor lounging spaces will captivate your immediate attention at first glance. 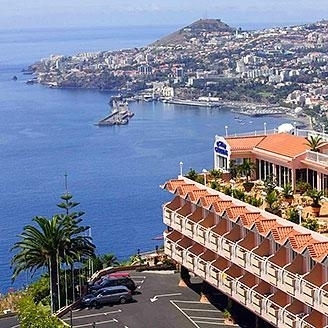 If you’re looking forward to sightseeing, sunbathing or hiking in Funchal, the Hotel do Centro is the perfect choice for your holiday! Just a step away from the city’s surrounding cable cars, beaches and historic sites, our 3-star hotel offers well-appointed rooms and amenities, delicious breakfast buffets, a cosy lounge and a pleasant, informal atmosphere. 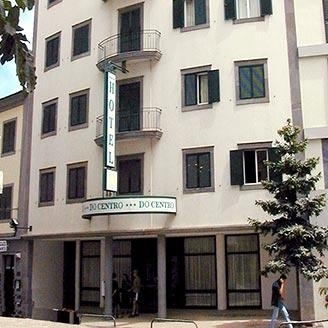 The 3 star Dorisol Florasol Hotel is a family-orientated hotel in a central location. Everything is nearby: shops, beach, bars, restaurants, supermarket and all you need for a memorable stay. The Hotel Dorisol Estrelícia is a 3 star hotel in a lively area just 400 meters from the fantastic Lido pools by the sea. The hotel also offers great facilities for all the members of the family and a quiet atmosphere. 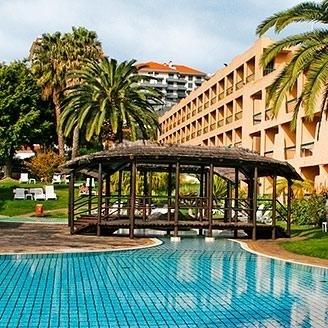 The Dom Pedro Garajau Hotel is located in a quiet area between Funchal and Caniço, enjoying the mild climate of the south coast of Madeira. A comfortable and relaxing 3 star hotel; the facilities of the Hotel Dorisol Mimosa are excellent as well as its top service. The hotel is located just few metres away from the hustle and bustle of the Lido area and all its amenities. 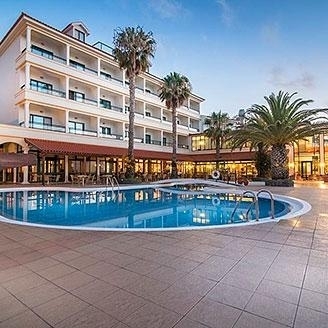 The Dorisol group presents the Dorisol Buganvília Hotel, a 3 star unit in the middle of the most sought after area in Madeira, the Lido; an animated location ideal for your holidays and just 400 meters away from the sea. 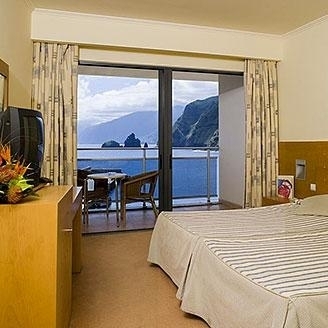 In Porto Moniz, a village in the north coast of Madeira and by the sea, the Hotel Salgueiro is a fine 3-star hotel with friendly and attentive service as well as comfortable accommodation in a relaxing environment. 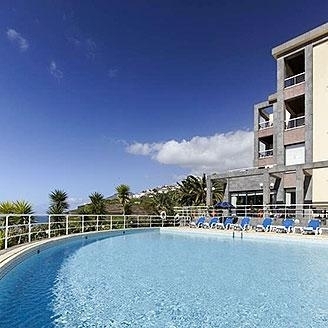 Beautifully set just 30 meters from the sea and far from the crowded hotels and tourist traps, the Apartments Falésia offers a holiday of rest and relaxation; a vacation away from the hustle and bustle of Funchal city. Pousada dos Vinháticos is situated between impressive landscapes and luscious vegetation. The area is especially enjoyed by nature lovers, walkers and those seeking tranquility.